New York City taxi drivers want the city to revoke Uber’s license to operate. But there may be a simpler approach that might actually benefit New Yorkers: Just put more taxis on the street. Uber is thriving in New York mainly because bad government policy limiting the number of available taxis created a huge business opportunity. Better government policy can take it away. Neither Uber nor the NYC Taxi & Limousine Commission immediately responded to requests for comment. 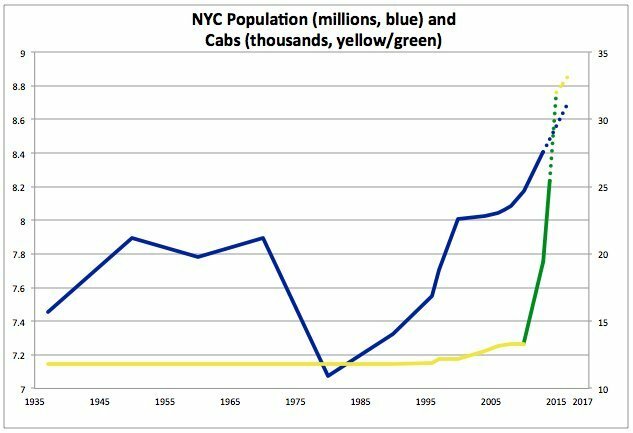 Here’s a chart of the population of New York and the total number of licensed cabs in the city, going back to when its medallion system of taxi licensing was first introduced in 1937. Astonishingly, there wasn’t a new medallion issued in New York for almost six decades: There were precisely 11,787 cabs in New York from 1937 to 1996, when the first modern medallion auction took place. That basically flat line up to 2013 was Uber’s business opportunity. In an increasingly wealthy city with a growing population, the number of people per cabs stayed at post-war levels for decades after that made any sense. New York City doesn’t just need more cabs, it needs way more cabs per person. New York has about three cabs per 1000 residents. Washington, D.C., has twelve. Las Vegas has six. The further this people-per-cab line drops, the worse it is for Uber. 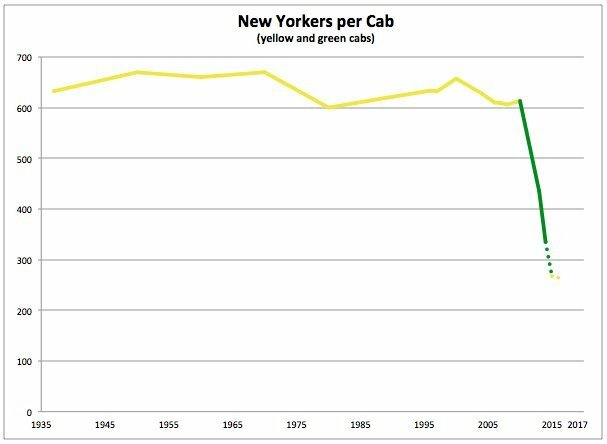 The real improvement in this ratio didn’t come until Mayor Michael Bloomberg’s green "borough cabs" hit the street. Green cabs are just like the city’s iconic yellow cabs, except they can only be hailed outside of Manhattan (though they can drop riders off in Manhattan). Twelve-thousand green cabs started operating between 2013 and 2014. Another 6,000 are due to be licensed in 2015, along with 2,000 new yellow cabs between 2015 and 2017 (those cabs, which are still subject to final city approval, are the dotted lines in the charts). Uber all along has considered taxis to be the villains in its story. Uber is right that strictly limiting the number of cabs in New York is bad policy that enriches medallion owners and hurts riders. It also hurts the public as a whole –- even the non-taxi-riding public. Medallion sales are a solid source of revenue for New York City. Mayor Bill de Blasio's budget is counting on $1.5 billion in revenue from medallion sales over the next three years. For a city struggling to balance its budget, that's significant. But if taxi owners are the villains, Uber is not necessarily the hero. Privatization doesn't have to be the only response to bad public policy. The best response to bad public policy is often just good public policy. New York City could prove that by continuing to massively increase the size of the city’s regulated cab fleet.